Any Night – Theatre Review | That's So Rad! Is it a sleepwalker’s nightmare or a sweet love story? Any Night at Sacred Fools Theater will have you hooked on finding out. Anna (Marie Fahlgren) is an attractive young woman looking for a new place to start over. Thanks to a flyer at her dance studio, she finds a basement apartment and quickly grows close to Patrick (Zac Thomas), the shy and friendly upstairs neighbor and caretaker. But it soon becomes apparent that Anna is troubled by the feeling of being stalked and a lifetime sleepwalking issue. As Patrick tries to help Anna, they become closer than ever but is Patrick really who he seems to be or is Anna just in a nightmare from which she cannot awaken? Originally developed by Theatre Network at the Vancouver Playhouse, it was written and originally performed by Daniel Arnold and Medina Hahn. Later, it was produced in Austin, TX by Filigree Productions and is touring as a guest production at Sacred Fool’s Theatre Company, directed and produced by Elizabeth V. Newman as well as produced by Stephanie Moore. 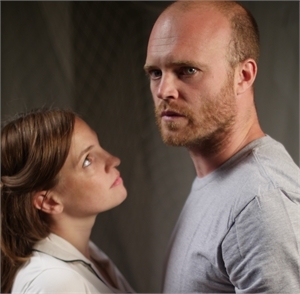 Stars Marie Fahlgren and Zac Thomas are a real-life husband and wife couple, which helps to depict the intense love, anger and lust that constantly shift throughout the performance. In addition to their acting, Fahlgren and Thomas bring a stylistic dance routine to the set as they traverse between Anna’s dream state and reality, past and present, taking the audience through a whirlwind of emotion with each step. The set, composed of rags and sticks and metal parts all composed together in a rugged sort of way, helps to add to the dreamlike nightmare. As the story frequently shifts throughout past, present, nightmares and reality, it’s almost hard to keep up with the story and know what is real and what is a dream and which of the two is really a nightmare. Is Patrick really the nice guy who was taken in as a teenager or is he someone taking advantage of a beautiful woman who seeks rescue from her sleepwalking nightmare? Is there a way that Anna can be saved before she drives herself to death through her sleepwalking, just like her mother did years ago? If Anna is not safe when she’s awake or asleep, the only way she knows how to find comfort is to take control of her life and find out what is real and what is a dream. Any Night plays at Sacred Fool’s Theater Company through July 30, 2017. This entry was posted in Reviews, Theatre and tagged discover hollywood, reviews, theatre, theatre reviews, writing, writing portfolio.